In a nutshell: Magic? Check. Intrigue? Check. Disturbing? Double check. 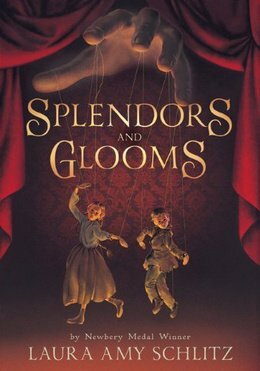 One gloomy day in Victorian London, Lizzie Rose and Parsefall, two orphans under the care of master puppeteer Gaspare Grisini, arrive with their caretaker at one of the most outstanding houses they’ve ever seen. Summoned to preform for resident 12-year old Clara Wintermute’s birthday party, Lizzie Rose and Parse assist Grisini in a performance that seems to entrance Clara during the last act. That night, Clara disappears and all fingers point towards Grisini due to her peculiar behavior during the performance. Lizzie Rose and Parsefall are shocked by Clara’s disappearance, but soon discover Grisini’s history of kidnapping and his ill intentions, so they plan their escape from him. All the while the children inadvertently become tangled in a web of hate and rivalry between Grisini and a witch who’s heart he broke many years ago; a witch who also has her own evil agenda. Laura Amy Schlitz surely has some supernatural power that flows through her pen and seeps into her writing. I felt as if I were in a trance, enchanted by her in a world that was so well written, it’s effect was truly sublime. A spell was cast. It took a great length of time for it to happen, but eventually it did and still has me left in thought upon finishing the story yesterday. You’re familiar with the saying, “Third times a charm”, right? Splendors and Glooms took me three separate times to read until I read it in it’s entirety on the third attempt. I first checked it out when the library received it back in August, and returned it after I was about a quarter through because the pace was so dreadfully slow. The majority of my reading is done at night, and every time I cracked it’s spine open I was asleep within a few paragraphs. It just wasn’t working for me, so I returned it. The second time I checked it out was after reading rave review after rave review, so I decided to give it another go. That time I got halfway through before I returned it yet again for the same reason. But, I wasn’t going to give up. When the audiobook arrived in late December I snatched it up and found it to be my saving grace. The words “gothic” and “thriller” and “creepy” come up a lot when reading reviews of this books, and are all extremely accurate descriptions. Early on in the book, Grisini kidnaps a child, “Clara”, and transforms her into a puppet. She does maintain, however, the ability to see and hear whats going on in her surroundings. It gives me the heebie jeebies just thinking about it. As if dolls weren’t creepy enough. The story set up took almost half the book before the wheels started turning, but after finally getting over that hump it was easy reading. Rich character development and unexpected twists carry the story through to the very end. And I must say, the audiobook format served as an excellent storytelling platform that I found to be extremely effective. I highly recommend it. Splendors and Glooms, to me, was an example of reading perseverance. I’m okay with letting a book go before it’s finished, but sometimes you just have to hold on until it’s spell takes over.